Jay Finn is general manager and chief technology officer at LaserCoil Technologies LLC, Napoleon, OH; 419/592-0050, www.lasercoil.com. If the customer isn’t happy, nothing else really matters. With that in mind, let’s start with improving customer experience and responsiveness. In today’s market, mass customization represents a key component in customer satisfaction. Consumers drive manufacturers to produce more models yet lower volumes of everything from cars to appliances more quickly, more efficiently and at lower costs. Meeting this shift requires the agility to respond quickly and to meet rapidly changing product designs and materials, and to do so in a cost-efficient manner. When the investment required to manufacture a part no longer can be spread out over a large number of parts, it must be divided over the lower volume. One of the best methods to address this: Reduce setup time and tooling costs. The traditional stamping process requires extensive die production time, taking anywhere from 6 mo. to 1 yr. to develop the original forming diesets. Add more time during tryout for modifications to the blank shape in order to assist the forming process, as well as an additional 14-16 wk. to produce the final production blanking die after tryout completes. So, imagine eliminating the need for a die, and simply programming a CNC laser unit to cut a desired shape. No need for expensive tooling; instead, parts could be delivered in a few days, in any quantity. Laser blanking produces a clean edge, regardless of the material being processed. Laser cutting provides this ability. With no dedicated tooling, material can be ordered and programming accomplished in less than one day–sometimes in just a few hours. Import the part shapes into the CAD/CAM system, orient and nest them to maximize material usage, and send the program off to the machine for processing. Need a change? Just tweak the program. Worthington Specialty Processing (WSP) in Jackson, MI, traveled this route, installing a LaserCoil laser-blanking system in 2014. The company’s blanking system achieves changeout times of 5 to 7 min. as compared to 30 to 35-min. changeovers for the company’s conventional blanking dies. A laser-blanking line can accommodate multiple cutting heads (such as this two-laser setup) to speed cut time and increase productivity. Use of lightweight material has increased across many industries, with advanced high-strength steels (AHSS) playing a significant role in the automotive sector. These steels are predicted to comprise as much as 40 percent of vehicle content on body and closures by 2025, which makes for some big changes on the pressroom floor. AHSS requires greater tonnage during stamping, forcing manufacturers to consider future equipment needs in favor of larger, more expensive stamping presses. Higher physical forces also take their toll on diesets and presses. Bearings and sliding surfaces wear more quickly, increasing the frequency of scheduled-maintenance downtime. Another challenge: AHSS’ negative effect on edge quality. When stamping AHSS, microfractures form along part edges and often develop into splits during subsequent forming processes. Additionally, manufacturers using laser-cut blanks for tryouts or as bridge parts while waiting for production tools often don’t discover a microfracture problem until it’s too late, after the die enters service. Workhardening brings similar problems. In many cases, stamped edges, unsuitable for downstream processes, must be trimmed ahead of time. Lasers, however, are material agnostic in terms of tensile or yield strength. The edges of laser-cut blanks don’t manifest the microfracture issues that arise with mechanical shearing of AHSS. And, a laser’s faster cutting speed results in smaller heat-affected zones on the blank edges—the hardness change on the cutting edge is smaller than that found on a mechanically sheared edge. WSP makes use of the process’ penchant for flexibility. Laser blanking enables optimization of part nesting to reduce costly scrap. Yes, laser blanking offers slightly slower speeds than stamping, but the process still runs fast—capable of cutting through 1-mm-thick aluminum, mild steel, AHSS and surface-sensitive materials at speeds to 2 m/sec. This makes laser blanking a viable and competitive choice for part volumes to 100,000/yr. Laser blanking may seem unsuitable when producing blanks through paid-for dies on a mechanical press running at 30 to 40 strokes/min., with minimal scrap and little tool changeover. 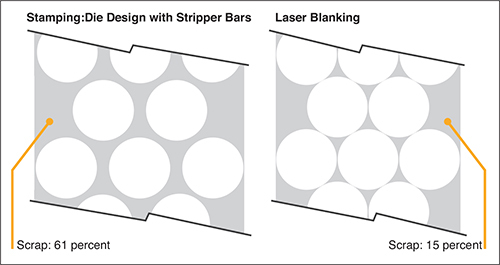 But, remember that a laser-blanking line can accommodate multiple cutting heads—two lasers are common, but more are available on custom machine configurations. LaserCoil can accommodate as many as eight heads, for instance. In addition, stamping requires die maintenance, an important consideration given the increased wear rates common when blanking high-strength steels. For laser blanking, setting up a new job is a matter of loading a new coil and a new program, and pushing cycle start versus the time required for a die change when stamping blanks. A laser setup also makes drop-in orders and test runs simple to accommodate. Work-in-process (WIP) is reduced, and the elimination of dies creates additional floor space. It’s hard to fathom that scrap from producing automobile bodies-in-white can range from 20 to 40 percent, inclusive of rejected parts. With raw-material costs increasing, and the premium prices attached to some high-strength steels, all steel processors have scrap-reduction goals. Software advancements give laser cutting great potential for cost savings through the ability to maximize raw-material usage and reduce scrap. Analysis of a 25-part list from an automotive program with an annual volume of 100,000 cars revealed that a laser-blanking manufacturer processing high-strength steels—stamping and shearing various chevrons, trapezoids, rectangles, and some developed and semi-developed pieces—may expect a total 5-yr. material cost of nearly $237 million. 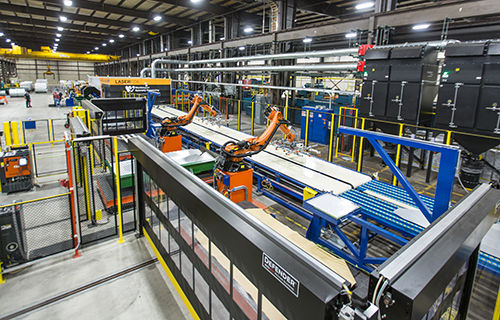 However, with the nesting capability offered by laser blanking as well as excellent performance in cutting advanced steels, this figure can be reduced to $217 million. And, don’t forget about fewer trips to the recycling yard. WSP realized some of these material savings through these advantages, and also found that it could be flexible with its cutting strategy. This results from the laser-blanking process’ ability to produce fully developed blanks, which are much closer to their final, formed shape than their mechanically produced counterparts. Lasers enable nesting and common-line cutting, and even allow smaller parts to be coproduced from normally unusable pieces of material—window cutouts, for example—that in a conventional stamping operation would be sent for recycling, or stacked and stored for future re-blanking, both of which are wasteful. Part makers looking for high volumes of simple-shaped parts out the door may not be inclined toward the laser-blanking process. In our example, the stamping line produced the required number of pieces in just 2300 hr., whereas the dual-headed laser needed 3400 hr. to finish the same job. But, remember that parts/hr. is not the end-all measurement. Costs to maintain dies and tooling dwarf those for laser-blanking consumables. And, tooling and tooling-maintenance costs have skyrocketed as companies that cut AHSS spend about four times what’s required to maintain tooling for mild steel. Comparing this to $40,000/yr. for maintenance on a dual-head laser blanker, concerns over lower throughput can be put to rest. In addition, laser-cut blanks better lend themselves for secondary operations. With tolerances of ±0.2 mm achievable, tailored blanks that require joining usually can go directly to the welding department. 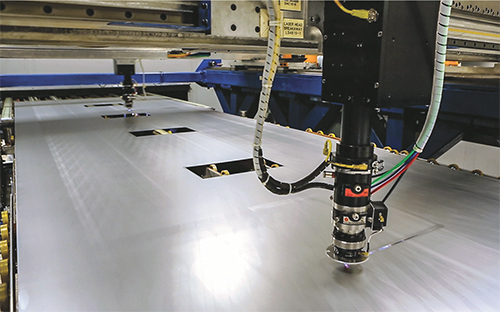 A LaserCoil customer, for example, prior to laser blanking, had to run each of its stamped blanks through a precision shear prior to the laser-welding process. But, laser cutting these blanks provided an edge that could be welded directly to the other part, eliminating secondary shearing and reducing the width of the coil required for processing. For established stampers, an investment in laser blanking may seem difficult to justify and undertake. But, operationally, a coil-blanking system requires no complex foundation or high bays—it can be installed on a flat floor. Laser-blanking units also can be integrated into a direct-feed production scenario—coupled to a transfer press, for example. This setup further reduces inventory, WIP and production time. They’re also less expensive than comparably sized mechanical presses, often by 30 percent or more. And, often a system can be retrofitted to an existing coil line with minimal disruption to the production floor.